Anita Mazumdar Desai was born in Mussoorie, India in 1935.Her mother was German and her father was a Bengali businessman. She grew up speaking German at home and Bengali, Urdu, Hindi and English outside the house, but, did not visit Germany until later in life as an adult. She first learned to read and write in English at school and as a result English became her preferred language in which to write. She began to write in English at the age of seven and published her first story at the age of nine. She grew up surrounded by Western literature and music, not realizing until she was older that this was an anomaly in her world where she also learned the Eastern culture and customs. 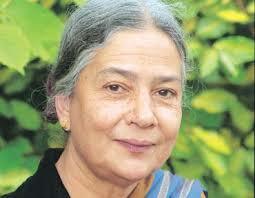 The author was educated at Queen Mary’s Higher Secondary School in Delhi, India and received her B.A. in English literature in 1957 from the Miranda House of the University of Delhi. The following year she married Ashvin Desai, the director of a computer software company and author of the book Between Eternities: Ideas on Life and The Cosmos. They have four children, including Booker Prize winning novelist Kiran Desai. The author taught for years at Mount Holyoke and the Massachusetts Institute of Technology, a private research university in Cambridge, Massachusetts, USA. She now spends most of the year outside of India. 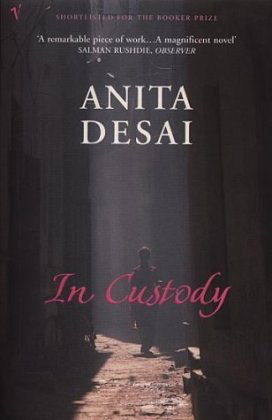 In Custody is the only book by Anita Desai that I have read, to date. It was shortlisted for the Booker Prize in 1984.This is a novel about a small-town man, Deven, who leads a drab, impoverished existence teaching Hindi at a small town college in the north of India . His great love is Urdu poetry and he gets the opportunity to go interview his hero, the great poet Nur. Nur is the greatest living Urdu poet. Deven’s wife neither shares nor understands his interest, but he has always loved Urdu poetry and missed the chance to be an Urdu language professor, so Deven is charmed into going to Delhi the big city. He shrinks at the idea of being exploited by his sharp and selfish friend Murad but the dream of meeting Nur draws Deven on. So he sets off on a number of adventures on Sundays, the one free day that he should have spent with his wife and son. Some of these are quite funny. What Deven finds at his hero’s house is misery and confusion. Having sunk into a senile old age, surrounded by fawning sycophants, married to a younger calculating wife who wants to use his glory to win herself fame, Nur is not what he once was: or perhaps he always was this. The saddest part is the result of the sessions. Drunk and encouraged by his admirers who follow him along to the sessions. To Deven’s disappointment, Nur offers nothing new or novel. Deven, a shrinking and weak man, is somehow drawn to this old poet and wishes to help and protect him as he cannot defend himself. Perhaps it is the tie of Urdu poetry that Deven remembers from his treasured times as a child with his father. So, in order to save the name and works of Nur for posterity, Deven decides to record his voice on tape for his small-town university. In the process Deven is exploited monetarily and emotionally, where Nur’s family and hangers on demand money to keep themselves happy, Murad refuses to pay him for submissions to his self-proclaimed literary magazine. His wife Sarla is indignant at his time away, his fellow professors think he is having an affair in Delhi or push him to get a taping of Nur’s voice. I found this book very interesting but increasingly depressing. As Deven’s world degenerated I kept hoping things would work well for him, but there is really no chance of that. In truth, Deven’s project that could only end in disaster. However, In Custody is a compelling read and I recommend the book.